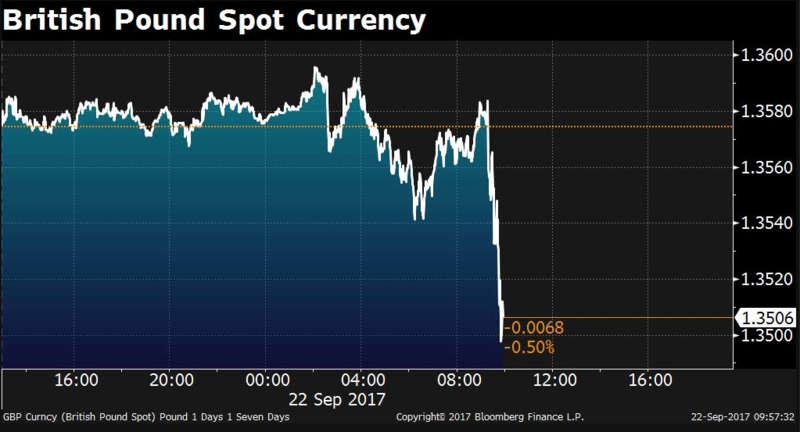 A graph of the pound against the US dollar has been made to look like the White Cliffs of Dover after Theresa May failed to hit the mark in Florence. Sterling took a dive immediately after the speech which gave few answers as to the direction of Brexit talks and raised yet more questions and uncertainty. Speaking after the talk Tim Graf, EMEA head of macro strategy at State Street Global Markets, said: “After great anticipation, Prime Minister Theresa May’s Florence speech offered few specifics and even fewer surprises. “The main takeaway for markets is a more formally expressed desire to pursue a transitional arrangement of ‘around two years’, from when the time limit following the triggering of Article 50 expires, presumably beginning from March 2019. “For the near-term, negotiations may likely be hampered by the lack of detail offered on the main items for discussion, namely the Irish border question, the ultimate financial settlement with the EU and the rights of EU citizens. European Commission Chief Negotiator Michel Barnier was not given much new to work with on these points. Social media reacted with muted praise for the Prime Minister. One commentator noted how May has managed to achieve the almost unachievable in her #FlorenceSpeech – by p*ssing off both Remainers and Brexiters. But the European Commission officials Theresa May was there to address snubbed the Prime Minister by not attending. And the main reaction to her speech was to wonder why the UK is still so unprepared and unclear about the consequences of Brexit. As it sinks in, the Florence speech demonstrates the sheer scale of May's mistake in making Article 50 notification when UK not ready. The £ fell against the $ not because of May’s speech but because of Moody’s downgrading of the UK’s credit rating — as you well know, Jack. Now tell us what happened to the £ against the euro in that same time frame.